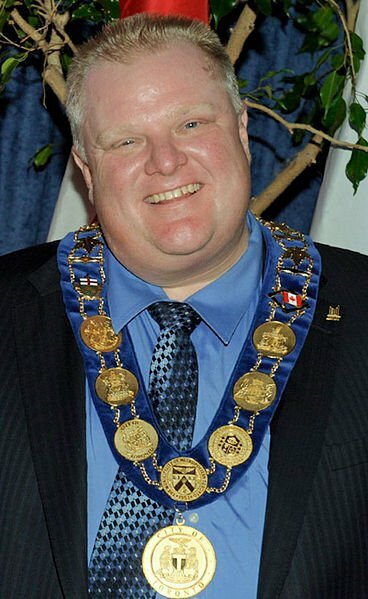 Definitely in the YCMTSU (You Can’t Make This Stuff Up) category, Rob Ford, the strapping 150-kilo-plus lad who brought the Etobicoke Hillbillies lifestyle to a major Canadian city is the 64th and current mayor of Toronto the Good. In ha-ha real life, Ford, a bullying, allegedly hard-drinking, allegedly crack-cocaine using, allegedly bum-pinching, allegedly fund-manipulating right-wing municipal politician is the favourite son of an upstanding Etobicoke suburban bourgeois family that made its fortune running the town’s Deco Labels and Tags printing firm. Father Doug Sr. was a member of the Ontario legislature during the Tory regime of Premier Mike Harris; brother Doug Jr. is a Toronto city councillor. In a recent episode of the long-running sitcom known as Toronto City Hall, or Pigs Can Fly, two alleged drug dealers allegedly offered to sell the Toronto Star newspaper and gawker.com website an alleged smartphone video that allegedly shows the mayor puffing away on alleged drug paraphernalia while allegedly making racist and homophobic remarks. Ford’s only current competition for size, behaving badly, and headlines is a former media reporter, Mike Duffy, who was appointed to the Canadian Senate by the Stephen Harper government, and then got into trouble over losing his lunch money or daily allowance or somesuch fiscal pittance. The Prime Minister’s chief-of-staff cut a $90,000 cheque to allow the miscreant senator to pay off his debts, and then promptly became the PM’s ex-chief-of-staff once the news got out. Hey, wait a minute. Is this really Toronto the Smug, Canada the Well-Governed? And why are those charming high school cheerleaders at the edge of the football field waving their pom-poms, shaking their booties, and crying out, “Etobi-COKE! Etobi-COKE! !”?